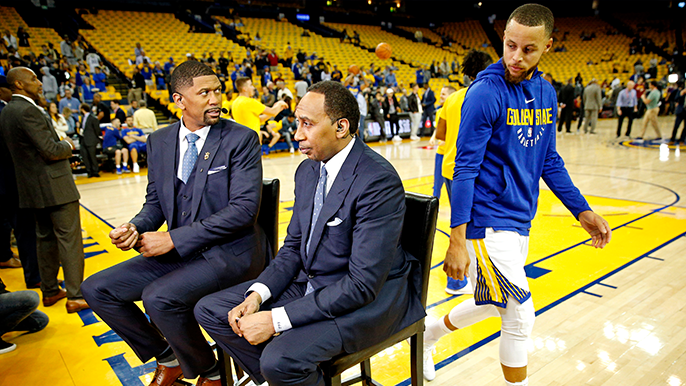 OAKLAND – Put some respect on his name, Stephen A. Smith. At least do a quick Google search. Alfonzo McKinnie had another solid night for the Warriors against the Memphis Grizzlies on Monday, scoring 14 points along with 3 assists, a pair of rebounds and another two 3-pointers in 29 minutes of action. His role has ballooned for the Warriors and he’s shown an almost unbelievable level of shooting confidence in addition to his defensive and rebounding energy. Yet, despite his performances, Steven A. Smith couldn’t be bothered to spell McKinnie’s first or last name right. Granted, it was in good spirit, as Smith was praising McKinnie, but it’s still a pretty lame look for a journalist.